For many years and through a fair few product branding changes the number 6 in the 64 Audio lineup always seemed to represent a type of reference sound for the company and fans alike. Not super flat analytical but rather a more a neutral to mid-centric signature with a tight bass and sparkling treble. The V6 from way back in 2013 was, in many ways, the go-to choice for those looking for a mid-fi custom fit experience with just that type of sound. Even with the release of the A6 under the ADEL brand that legacy signature resonated in the A6’s performance with solid feedback on how the ADEL system further refined the high-end response with phrases such as “fatigue-free”. It has proved a popular choice for musicians, plenty of audiophiles and studio peeps. So now I guess we have an unofficial ‘generation 3’ of the 6 in the form of the A6 packed with 64 Audio’s new APEX technology and 6 BA drivers which have now replaced the ADEL technology. The A6 retails from $1199 upwards ($899 for the universal) depending on the level of customization you want to have. It does not seem that long actually since I discussed ADEL at length during the A12 review last year so I was a bit surprised to see the term APEX recently replacing it. Turns out the laws of supply and demand played a heavy role in the switch to APEX which is 64 Audio’s own in-house technology. APEX is short for Air Pressure Exchange. Essentially the end goal is the same and that is to reduce the level of pneumatic pressure being delivered alongside sound pressure when inserting and using an IEM, or in this case a CIEM. By reducing this type of pressure the eardrum gets less of a work over. Thus, the potential of long-term hearing damage from using such devices is reduced allowing you to safely play music at a louder level than you normally can. Like ADEL, APEX works its magic through a series of small modules that are designed to fit snugly into the actual shell of the CIEM. Naturally, a parting of ways means a requirement to come up with a new physical design that could convert APEX into reality without infringing on patents from the previously used product. 64 Audio came up with such a design using a multi-cell studio-grade TPE material which they claim to be very effective and should yield a consistent level of results with the new technology when deployed over the long term. Since we last reviewed a 64 Audio product the range has now been simplified into two channels, customs, and universal. The Ambient Universal series is no longer available. Universal is tagged as their U series and customs with A series. All of them come with APEX modular as stock with the option to buy other modules. Both lines reflect each other in terms of what they offer with the A series having the additional A2e. The A6 is right smack in the middle of the range and is a 6 BA driver design with only the 10, 12 and all new 18 driver design above them in the A range. Should you wish to buy alternative APEX modules these are now available under the accessory options. You can opt either for the M15 APEX module or the M20 APEX module and both are the same $99 price. The M20 offers a straight -20dB of noise isolation using the APEX technology and the M15, which 64Audio are pitching as the middle ground between bass attenuation and isolation. The M15 features a combination of dual ambient ports and modified internals to achieve -15dB isolation at 350Hz and an additional 4dB cut at 20Hz to achieve that compromise. The 64Audio ordering process is still the gold standard for online interaction and building your custom IEM as far as I am concerned. Nothing has changed since 2014 and no company has come up with something as involving as the 64 Audio automated design tool. 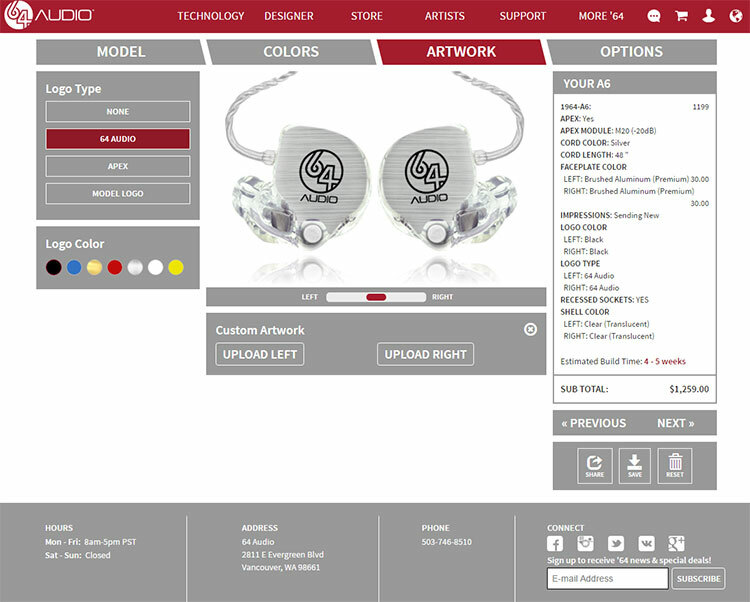 It takes you right the way through choosing shells, face plates, designs, initials, colors, modules and cables. It finishes with a choice of shipping before it takes you to the payment options. That’s great control and choice right at your fingertips. Yet the journey doesn’t end there. You get an account that allows you to log in and keep track of your build process and where they are and what there is left to do. You also get an email letting you know from time to time what is left to do which is very cute. Finally, you get an update with tracking details when the unit is being shipped out. It does not come any better than that. All of this within three to four weeks max which makes 64 Audio one of the fastest for turning around your purchased design into reality. This being my third design with 64 Audio I opted for something with a bit more sparkle. I am a sucker for browns, orange and black so I bucked the trend and went with a clear translucent shell and tips, brushed aluminum premium face plates, a matching silver cable, and the 64 Audio logo on front. You can, of course, have your own printed design at the front should you wish to personalize the experience a bit further. Since I last went through the online design interface 64 Audio have added one more shell color to the rather limited shell color range and that is translucent charcoal. Now I believe it is possible 64 Audio will be expanding their repertoire with the new A18 (TBC), but for me, this is all a bit limited in scope despite the fact it is a high-end 3D printing process. Yup, there are plenty of faceplates to choose from but the lack of matching shell options does make some of them a bit moot. I do hope the guys can figure out new ways of bringing in a wider range of shell colors in the future so we can color coordinate with a bit more panache. Nothing new here from the last time with 64 Audio as I stuck with the closed or relaxed jaw impressions which of late has been serving me pretty well with tight seals and great isolation. You can, of course, try open jaw clay impressions which might be a bit more relaxed overall but unless the customs company is very specific I would opt with closed. There is nothing worse than getting a set where the seal gets broken with a slightly loose fitting and having to send them back. Do you have any plans to compare them to the 64 Audio’s A8 ? As far as I understand the main difference is two “extra” armatures for bass on A8 (4x bass, 2x mid, 2x high), and I’m really curious as to your opinion on how that affects overall sound. Actually we have done the V8 review a long time ago and I would presume the a8 is not that far off. However I won’t know until March at CanJam when I demo it thanks. Checked out the v8 review, looks like a8 should end up being “very okay unit” for someone who appreciates extended, detailed bass, but ideally not at the expense of mids :). But I think I’ll still wait for your impressions of the “modern a8” in March. No worries, not sure what will happen with 64 Audio as they have a new guy there who is not very responsive but will catch up with them at CanJam. Oh and the reason why you might not see your comments right away is our cache system. Sometimes it holds things back a few mins. How are these in terms of resolution and detail after cable upgrades? Can they compare with, say the… CA Vegas? (I’m trying to decide between these and the Empire Ears Athena, but I doubt you’ve reviewed it in depth. I have the 1964 Adel A6’s and within a month they broke. More than half of the 6ish people I know with 1964 A series have had breakages in the mould or the cord. The mould is a thing layer of plastic, it’s not solid inside at all. The cable it reeeeeeally thin. I just don’t understand why at this insanely expensive price the build quality is so low. When you say cord, you mean the cable? Thanks for the review. I’ll be trying out the cables, but I also wanted to ask you about a good DAC for these IEMs. Would you consider the HA-2SE to be a good match for these or would a Mojo be a better option? I’m looking at using these with my Iphone, so the less cables possible the better. Thanks! Depends on your budget, the new HA-2SE is better than the HA-2 and we have a review of that out currently which you might want to check on. It’s slimmer and stacks better than the Mojo and has analog inputs and of course cheaper. Tonally though I prefer the Mojo, it just has that bit more detail and a blacker background. Thanks for the incredibly in-depth review of the A6 CIEMs. I read this with interest because I have used a pair of A6s (ADEL) for about a year now. As per your assessments, they do sound great as in-ear monitors; when playing the bass in the group I am with. I can imagine how improved the overall sound will be when I do decide to swap out the stock cable with an advanced cable (talk about making an excellent product even more excellent). Since my A6s were built with the ADEL (S1) module, I was interested in the Apex M15 module as an additional option, given the venue and situation. I did obtain a set of M15s and used them last weekend. They are definitely different than the S1s. The M15s are indeed more spacious, but with a tad less bass response, which was really not that much less. Straight out, I needed to adjust my standard mix a little because (with slightly less isolation) I could now hear more of the instruments and vocals through the more-ambient M15 ports without increasing levels, so I needed to ultimately reduce the level of some of the instruments in my Qmix settings, given the added ambiance. So, there is indeed much more openness and spaciousness with the M15s, and this is what I was looking for. I was told that the M20s most approximate the ADEL S1s, so, with the S1s and now with the M15s, I I’ve got both sets to choose from. The M15s are a great set of modules for adding that extra ambiance and spaciousness to the overall sound-stage. Yeah go with the M15, just that bit more open for me. Would love if you could compare the sound signature to the 64 Audio A12! Sadly both have different modules, A12 is ADEL and A6 is Apex but cutting a long story short the A12 is better regardless of modules. Better staging, more resolution, slightly more neutral sound with more headroom.